JHi there, my name is #HeathCliffe. I am fluffy miniature of the King Cheetah Heathcliffe that was adopted by All Things Jabu at the Ann van Dyk Cheetah Sanctuary. Throughout the year Marcel from Run Ride Dive, Dirk and Jabu from here will take me around the world to take some photos and to raise awareness for the Ann van Dyk Cheetah Sanctuary in Harties. Whats really cool is that Heathcliffe now has the first official God Parents being Run Ride Dive and All Things Jabu. So I heard that Jabu and his wife were planning a holiday to Europe and I was super excited to hear that they would be taking me with. Although Jabu is an honourable man, his eyes sometimes get a bit blinded by his incredible love for his wife, so to make sure I got to go along, I snuck in to Jabu’s bag. With out any other worries, #HeathCliffe was on his way to Italy and in particular Venice! Getting to Venice was one of the coolest things I have ever experienced. I mean this place is exactly like the pictures I see in books and I couldn’t wait to get a chance to get my picture taken with some of the canals. The coolest thing was seeing the other tourists take some of my pictures too. It was in Venice that we boarded the MSC Lirica, our home for the next week, as we traveled around the Mediterranean Ocean. The ship itself was pretty epic with more food to eat than we could stomach and I of course slept like a king. On the ship I also got to watch incredible performances at the theatre each night and I generally got my own seat. Well except for the Michael Jackson night, when the theatre was packed! When we got to Split in Croatia, we were quickly met with the start of the Split half marathon. This got Jabu super excited and should have been a sign that he is mad and should learn that taxi’s are okay. I did manage to get a photo with the statue of Gregory of Nin. This statue is massive and makes Jabu look like an ant. 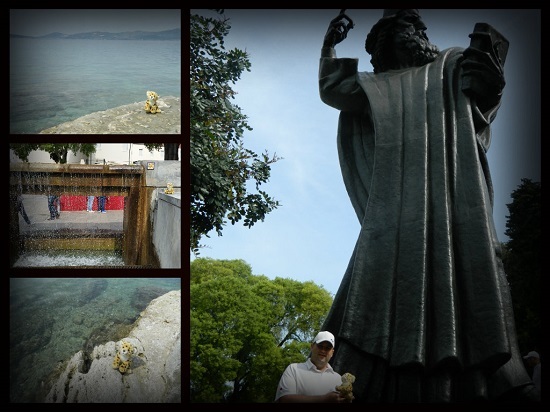 Jabu desperately wanted to see the stadium, because he has a man crush on all stadiums, and we got up to the stadium of home town heroes Hadjuk Split. With no game on, the stadium was locked up and so we were slightly disappointed, before we came across a training pitch with FC Ojinek training for their game with Hadjuk the next day. Jabu made a decision that we could take a shortcut through the forest. Of course if Jabu ever offers you a shortcut you will quickly learn that it’s not short, it’s usually double the distance. It did lead us to Bene beach, one of the most peaceful places on earth. But it also led to a 25km walk along the half-marathon route. The next stop on our route was the perfect city of Santorini in Greece. 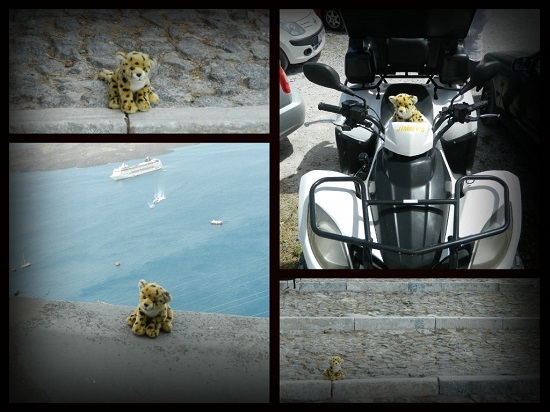 Santorini has a cable car from the dock, but of course Jabu wanted to do the short cut. The Short cut is a steep ascent on a cobble stone path in amongst the famous donkeys. The views are breath-taking and was one of my highlights of the trip. Once we got to the top we finally saw Jabu make a good decision (It was actually made by Mrs Jabu) and we rented a quad bike to travel around roads that are so similar to Chapmans Peak in Cape Town. Oia, the town we hit, was quite honestly the most incredible place I have ever seen. The scent of the restaurants, the sound of conversation and ocean and the site of peaked ocean-views. Its something you have to experience. 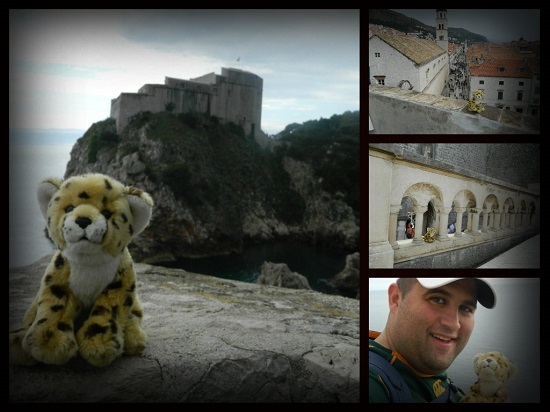 We also managed to hit up Dubrovnik in Croatia, which is where they shoot the Game of Thrones TV series. This time we got to take a cable car and get a great view of the Old City, which is the most medieval-like town in Europe. The other epic thing we did was take a walk on the wall of the city, it’s about 2.5 km long but it makes for some incredible views and even better pictures. At the end of the day I was so happy to get home as South Africa is the most special place and home is always something I look forward to. I really wanted to thank Jabu and his wife for taking me with on this adventure. To view all the photos of this adventure as well as my other adventures with the team, head over to Facebook to our album right here. You can also join the conversation at #HeathCliffe on Facebook, Instagram and Twitter. The Ann van Dyk Cheetah Sanctuary are doing incredible things for the conservation of wild life and any lit bit of support helps.